Some of Sara Katz’s most appealing paintings are haphazardly stacked against a wall in a corner of her Ferrisburgh studio, hidden behind a few of her signature depictions of nondescript highways and hazy, unpeopled expanses. Katz’s realistic renditions of animals and insects in a series called “Predator/Prey” prove her to be a more versatile and classically inclined artist than one might assume after viewing the work she shows in galleries — for example, the forlorn industrial scenes and blurry roadways currently on display at Vintage Inspired Lifestyle Market in Burlington. 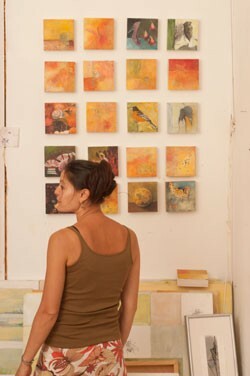 Katz chose the same themes for her contribution to a group show of small paintings at Edgewater Gallery in Middlebury last year. Asked whether she ever paints people (none are visible in the paintings at her high-ceilinged studio), Katz says she does regularly compose portraits, either on commission or out of love for a sitter. But she can’t show strangers the likenesses of her husband, landscape architect H. Keith Wagner, “because he’s naked,” Katz says. She remains smilingly bashful even after a visitor cites the tradition of male nudes in Western art. In the sequestered “Predator/Prey” series, Katz has painted a comparatively large and carefully observed carnivore on each of half-a-dozen 3-foot-by-3-foot panels that are divided into pale-colored, checkerboard squares. In some of these bordered spaces, she’s painted images of what’s on a particular predator’s menu: mice for a hawk, flies for a toad, rabbits for a fox. The combination of a soft palette and the implied tension of the subject matter in “Predator/Prey” grabs a viewer’s attention and does not let go. Katz would surely find buyers for the pieces in this series if she revealed them to the public. But the 34-year-old isn’t interested in making a career as an artist. She has a full-time job as assistant director of Burlington City Arts, where she’s worked since graduating from Skidmore College 13 years ago. Katz and Wagner also have a 1-year-old son, Hudson, who toddles around the couple’s strikingly minimalist home during a recent visit. These commitments limit the time Katz can spend in the stand-alone studio Wagner built for her soon after completing their house in 2003. As a result, she’s working small these days. “Pieces this size are something I’m able to complete,” Katz says, pointing to a grouping of 20 panels, each six inches square, arranged in a grid on a studio wall. The individual subjects range widely — from fossil-like forms to close-ups of brightly colored algae to a robin, other winged creatures and, weirdly, a single, high-heeled shoe. “I don’t know where that came from,” Katz admits. Katz is self-confident, Kraft adds, but there’s “no hubris about her.” For her part, Katz says she’s content to stay at BCA for the indefinite future. “Maybe I’ll become a full-time artist when I’m an old lady,” she muses. The overpasses and stretches of asphalt “are in themselves not all that inspiring,” Katz concedes. “They become more interesting as they’re being painted.” She says she creates a gauzy effect to suggest a fleeting memory, while using sunny colors to infuse a banal subject with a pleasant sense of nostalgia. She also uses oils almost exclusively — perhaps partly as a subconscious homage to her mother. “I can remember the smell of oil paint as a kid,” Katz says, and explains that her Japanese American mother, Vicki Yamasaki, used to compose landscapes in the family’s Cabot home. Katz moved there at age 8 from southern New Jersey, where her father, Gary Katz, worked as a vegetable farmer, though he was trained as a biochemist. What? There are farmers in New Jersey? Who knew? “South Jersey is the reason why it’s called the Garden State,” Katz points out. She’s picked up the ag interest from her dad, and tends two vegetable gardens on the 16-acre parcel she and Wagner own. In addition to Katz’s studio and the family’s open-interior, metal-and-cement home, the property contains a metal-working shop where Wagner welds and sculpts. It seems a fitting avocation for a 6-foot-8-inch man who weighs around 250 pounds. Several of Wagner’s big metal balls are scattered on gravel around the entrance to the house.